Fantastique Vues jour et nuit! Mise à jour avec la climatisation! NOTE: LES PORTES DE VERRE DE CHAMBRE À COUCHER PRINCIPALE ONT TINT LE VERRE POUR LA CONFIDENTIALITÉ! S'il vous plaît consulter notre calendrier en ligne à jour. Si votre date demandée est marqué d'un X ne sont pas disponibles. Si elle montre comme étant disponibles, la première étape consiste à remplir une demande en ligne. S'il vous plaît sentir libre de soumettre des questions dans le cadre de votre demande en ligne. Ceci est la meilleure façon pour nous de répondre rapidement et de vous fournir un devis détaillé. Nous venons de terminer notre projet 2017 au Sunset Poipu avec de toutes nouvelles unités de climatisation dans chaque pièce! Vous êtes invités à profiter de cette maison en bord de mer fraîche et bien aménagée. NOTE: Nous n'avons pas de piscine dans notre complexe. Le compromis est que l'absence d'une piscine peut être un facteur dans notre population locataire généralement calme. L'intérieur de notre maison est surpassée que par son cadre. Sunset Poipu est situé sur la Rive-Sud côté ensoleillé de Kauai de l'île. Plus précisément, notre île est situé à Poipu, dans ce que beaucoup considèrent comme lieu de vacances le plus souhaitable dans l'ensemble de Kauai. Il littéralement 35 pieds de l'océan, offrent des vues imbattables, sans jamais quitter la véranda (ou le coin salle à manger ou le salon ou la cuisine ou la chambre des maîtres, d'ailleurs). Notamment, les multi-million de foyers en dollars prévus pour le développement voisin Kukuiula ont nulle part à proximité des points de vue qui sont les vôtres ici. Expérience en bord de mer à son meilleur au coucher du soleil Poipu. The property is in a great location which is oceanfront with beautiful views of the sunset! Everything needed was provided in the unit which was really nice. It gives you a chance to have something in the interim of checking in and getting to a store. All beach accessories were provided as well. Loved the floor to ceiling windows/doors that look out over the ocean and loved hearing the ocean throughout the day and night! Happy that I selected this property! Very convenient location. Was great to see the turtles every morning. Can see the sun rise each morning and set each evening, which is lovely. The owners left a bottle of white in the fridge upon arrival, which was thoughtful and appreciated. There are no downsides to the property, itself, but note that it is likely that your rental will need to be washed daily if you park it in the common parking area underneath the trees (and birds). Luckily there is a power wash area near the front of the building. Good floor plan conveniently located and comfortable. We had a fantastic 5 day stay and thoroughly enjoyed being right on the ocean. From most locations in the condo you have a view of the ocean and especially in the dining and living room areas. My wife was particularly interested in being able to surf and we could watch the waves and surfers right from the condo. We loved to have the sliding glass door and front door open to let the breeze and the sound of the ocean fill the space and also greatly valued having air conditioning available when it got a bit hot. We would definitely come back here in a heartbeat when we're on the island again. We had a great stay. Condo complex is terrific with a great location. We did a lot of sight seeing with our rental car, so being in the south made it easy to head to either east/north side of island or west. A lot of great restaurants and shops near condo so that was really easy as well. Condo itself was really nice: comfortable, clean, and well-provisioned. Amazing view! We would definitely stay here again. Though we’ve been to Hawaii a number of times, this was our first visit to Kauai and we were delighted to stay at this lovely condo for two weeks in February 2018. Clean, well equipped and perfectly situated to fully enjoy Kauai; this rental exceeded our expectations. First, the view is breathtaking. It is perfectly situated so guests can enjoy the spectacular ocean vista, its sights (turtles, boats, surfers, etc.) and the sounds of the sea waves. The layout, with large floor to ceiling windows the width of the living area (which includes the living room, kitchen and dining table) allows you to enjoy this awesome view inside as well as out. 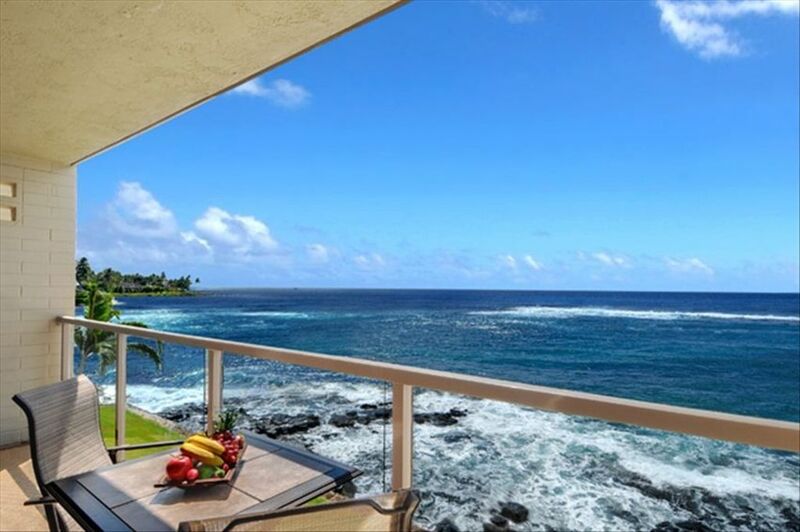 The lanai is comfortable, very private and the sunrises and sunsets and view are the best! The bedrooms are comfortable and the unit is fully stocked with a variety of beach equipment, coolers and toys, which add to guest convenience and enjoyment. Location is everything and we found that to be true here. There’s a sandy beach with snorkeling steps from the building and it was an excellent base to explore all other sights of Kauai. Wonderful area for walking to near and far sightseeing, shops and restaurants. Lots of nearby shopping, great large and small restaurants in a range of prices (some walkable), and close enough to the Costco and Safeway in Lihue to make a big shopping trip worthwhile. We also enjoyed nearby Koloa Town. We had a minor issue with the Wi-Fi since a new router had just been installed but the owner immediately responded and cleared it up. Likewise, we found the building management to be responsive and professional. Maintenance of the building is always immaculate and the washer and dryer on each floor is a godsend and mostly always available. Thank you for your review, Gerald! We take so much pride in putting time and effort to make sure our guests can enjoy our place and make great memories with the ones they love. Reading your comments made my day and inspires me to keep improving! except during holiday season: --stays of 11-13 nights: $10 discount/night --stays of 14 nights or more: $15 discount/night we accept only paypal & personal checks (w/ a $25 service charge).